Set of 4 titanium replacement bolts, saving 29 grams over Brompton's original bolts. The set consist of one stem bolt, one handlebar catch bolt, one handlebar bolt and one suspension blok bolt. 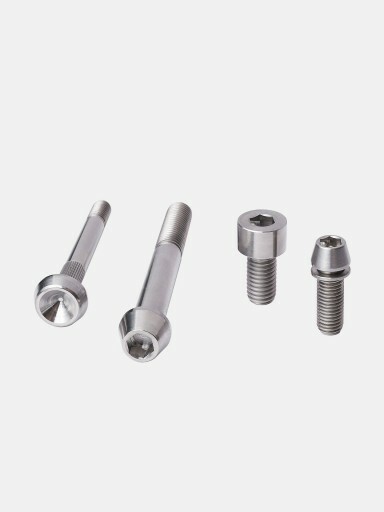 The bolts are made from titanium grade 5, and have rolled thread. Beside from saving weight the bolts are also corrosion resistant. Stem Bolt: M8 x 70 mm Hexagon Tapered Socket Head Cap Bolt. Partly threaded, 30 mm. Handlebar Catch Bolt: M8 x 16 mm Hexagon Socket Head Cap Bolt. Fully theaded. Handlebar Bolt: M7 x 20 mm, Hexagon Tapered Socket Head Cap Bolt, with integrated washer. Fully theaded. Suspension Blok Bolt: M6 x 61 mm, Special Head Bolt. Partly threaded, 15 mm.